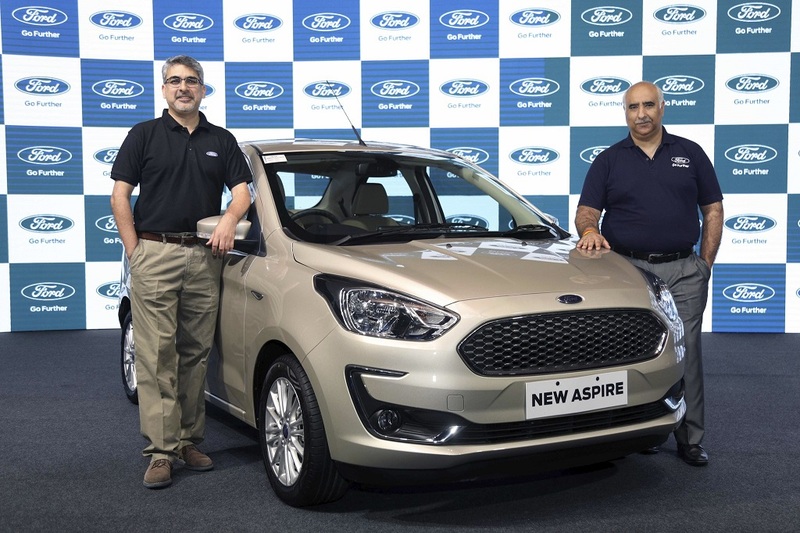 NEW DELHI, India, Oct. 4, 2018: Ford India today introduced its compact sedan – New Ford Aspire – at a compelling introductory price starting from INR 555,000. Combining Power, Style & Substance, the New Ford Aspire is a fresh take on compact sedans with many segment-best technologies, best-in-class safety, fun-to-drive DNA, and unmatched cost of ownership.The car is available in five variants across two fuel options and seven colours. New Ford Aspire is big on capabilities and strengthens Ford’s fun-to-drive credentials. The compact sedan now offers Ford’s all-new, three-cylinder 1.2L TiVCT petrol engine that is small, light and fuel efficient. The naturally aspirated engine generates best-in-class 96 PS of peak power and 120 Nm of torque while delivering an outstanding fuel efficiency of 20.4 KM/l. For the Diesel lovers, New Ford Aspire comes with the trusted 1.5L TDCi engine delivering class-leading 100 PS peak power, 215 Nm of torque and fuel economy of 26.1 KM/l. Both engines are paired with an all-new, five-speed manual transmission that’s sportier and fun-to-drive. This new manual transmission is almost 15% lighter and helps improve fuel economy while reducing NVH. It requires 40% lesser gear oil than its predecessor. 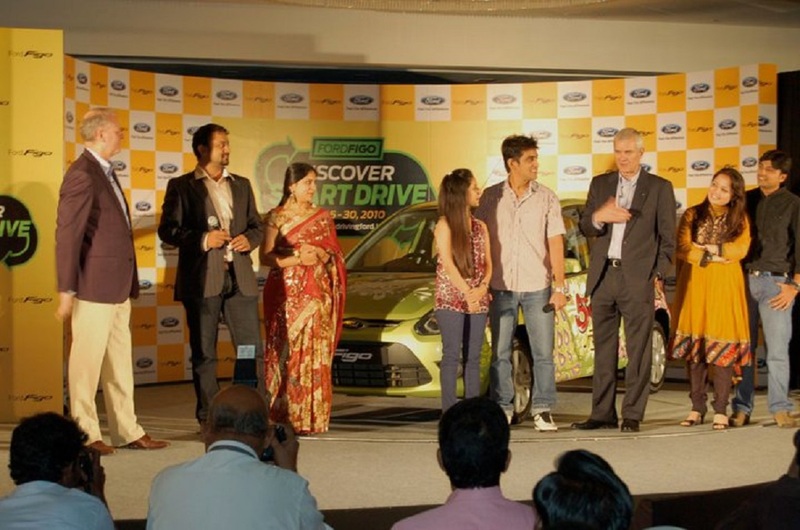 Drivers will experience slicker, more responsive gear shifts when they behind the wheel. Offering greater power of choice, Ford is also introducing its latest six-speed Automatic Transmission on the New Ford Aspire. Paired to the latest 1.5L Petrol, three-cylinder engine, the Automatic New Ford Aspire delivers a peak power of 123 PS. All three engines will be the most powerful in their respective categories. The compact, sub-4-meter design in the New Ford Aspire has been smartly executed to ensure it looks proportionate from every angle. Redesigned front fascia features a dynamic three-dimensional cellular grille. This makes the car not just stand apart but leave a mark. New fog lamps are encrusted in a premium chrome surrounding and harmoniously integrated into the front bumper. Headlamps in the New Ford Aspire feature a black encasing that looks sporty yet premium. Similarly, new design tail lamps accentuate its formidable stance on the road. New Ford Aspire also features premium alloys and bigger 15-inch tyres to deliver confidence and planted drive dynamics. The cabin in the New Ford Aspire features warm, beige interiors, adding to the premium-ness and the enhanced sense of space. The seats have better support to make every journey comfortable, including a central armrest with two integrated cup or bottle holders in the rear. The cabin is replete with convenience features including a reverse parking camera, best-in-class automatic climate control system, two USB slots, push-button start/stop, electrochromic IRVM, rain-sensing wipers and automatic headlamps among many others. New Ford Aspire is a substantial package, offering a host of innovations to keep its owners, informed, entertained and safe at all times. The compact sedan will continue Ford’s leadership on safety, offering standard dual airbags across the variant line-up. For those looking for greater safety, it will offer up to six airbags on top Titanium+ trim. Going beyond airbags, Ford Aspire will offer several features to enhance occupant safety such as Anti-Lock Braking System (ABS) with Electronic Brake-force Distribution (EBD), helping drivers better grip, while keeping the drive smooth. The New Ford Aspire will enable its owners to navigate quick turns and bends with Electronic Stability Program (ESP) and Electric Power Assisted Steering (EPAS). Also in Automatic Transmission, the Hill-Launch Assist feature will ensure greater control on inclines. The New Ford Aspire features Ford’s in-car infotainment system, SYNC 3 with a 6.5-inch touchscreen which allows drivers to control their entertainment and connected smartphone using voice commands. Ensuring complete peace-of-mind, the New Ford Aspire is the only compact sedan in India to come with a first-in-class five-year or 100,000 KM warranty, which includes 2-year factory warranty and 3-year extended warranty. 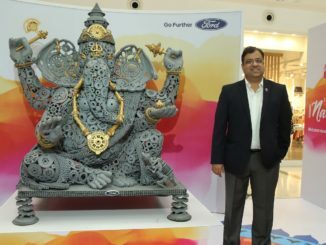 The New Ford Aspire is produced at Ford India’s Sanand Factory in Gujarat, for consumers in India and all around the world. * All prices ex-showroom, Pan-India.